reg e gaines is a two-time Tony Award-nominated playwright and Grammy Award-nominated lyricist. Don't miss this amazing opportunity to be enlightened and inspired. What's the difference between spoken word and a play? How can you use your skills as a spoken word artist to create a piece of drama for the stage? How can you give your play more texture and power by incorporating elements of spoken word artistry? Join critically acclaimed playwright, poet, and lyricist reg e gaines to explore the places where spoken word and traditional drama meet. Learn the similarities between dramatic poetry, hip-hop inflected spoken word pieces, and classic monologues. Create new text and learn to excite the imagination when revisiting unpolished pieces. Analyze dramatic soliloquies and sharpen your performance skills. Participants are encouraged to bring work in progress, ideas being considered for development, and "signature poems" which have been performed before audiences. No experience necessary, but passion required. 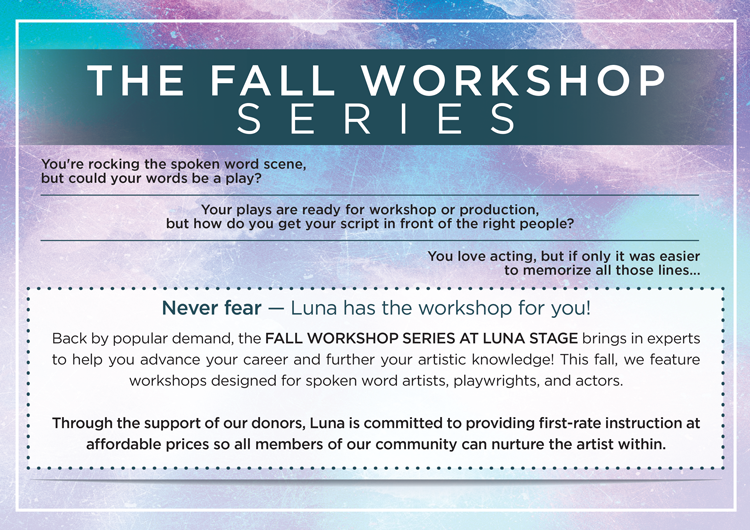 Lia Romeo is a published, produced, critically-acclaimed playwright. Come benefit from her experience. Jared Kelner is a Master Teacher who has led classes across the country. Come and learn his unique approach. THIS IS A BENEFIT PERFORMANCE TO SUPPORT THE DEVELOPMENT OF THIS NEW WORK BY THESE AWARD-WINNING ARTISTS. DON'T WAIT! PURCHASE YOUR TICKETS HERE.